The verdict? The book isn't wretched-bad, but the tone is wildly different from anything related to the Hulk in previous years. In no small part that's due to the temperament of the protagonist, for one thing Cho definitely isn't is Banner. The flippant quality is actually marginally close to that of She-Hulk's second series, a fact to which Pak no doubt paid homage when he had Jennifer Walters' emerald alter-ego guest-star during the first storyline. (The cover gag on #4 recalls it very clearly.) It's clear Pak relishes exploring more of Cho's world, what with the introduction of his oft-mentioned, never-before-seen sister, Madame Curie "Maddy" Cho. Unfortunately, much of the series feels like Pak is trying to stuff a gamma-enhanced square peg into a round hole, shoehorning in psychological trauma in order to give Cho an artificial threat of losing control to his own "monster within." I thought Pak and co-writer Fred Van Lente did an excellent job of bringing Cho's origin tale--in which his parents were killed by an evil madman named Pythagoras Dupree (I can't make this stuff up)--to a vital conclusion. 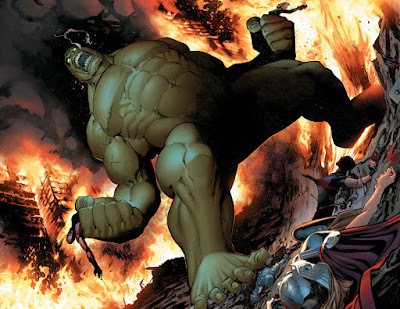 That said, Marvel needed a reason for Cho to be a Hulk, so they just couldn't let the past rest. Cue the depressing "he's just happy-go-lucky because he's repressing all those awful memories of his parents dying" backstory. Don't get me wrong--there's still no one better to write Cho than Pak. The best parts of the book so far have been those in which the original Hulk has appeared. 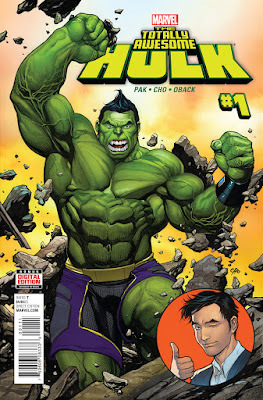 In the first four issues, Pak flashed back to the origin of Cho's Hulk, wherein Banner's monster absorbed the radiation from a leak on Kiber Island, insodoing becoming a greater danger. When Tony Stark thought to exile him to the Negative Zone, Cho instead used his own devices to drain the radiation into himself, curing Banner while turning himself into a brand new monster. 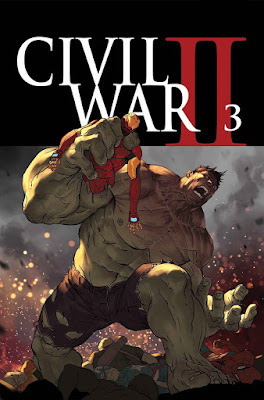 And after two months away, Banner has again returned with the first of the series' crossovers into Marvel's summer event, Civil War II, which figures to be especially important for the former Green Goliath. What have we here? A psychic vision of a naked, giant-sized, hacked-off Hulk with the bodies of Iron Man and Captain Marvel in either hand, standing above the corpses of more Avengers while a city burns behind him. In the context of the story, a new Inhuman with the power to see the future causes a rift between heroes who wish to use his power to stop catastrophic events before they happen. And in this vision, the Hulk kills everybody. This, my friends, is the battle I have with people who just don't understand the Hulk. Before you say, well, "Isn't that Amadeus Cho, not Banner?" I'll point out that Marvel editor-in-chief Axel Alonso is on-record saying that the Hulk in the image above is indeed Banner, not Cho. The Hulk doesn't just go on random rampages, and he's not a murderer. Bruce Banner is a good and decent human being, and a part of him still exists inside while his body metamorphoses into the monster. It's that part that helps to guide his actions, to rein in the beast, to ensure he never really becomes the monster the world thinks he is. 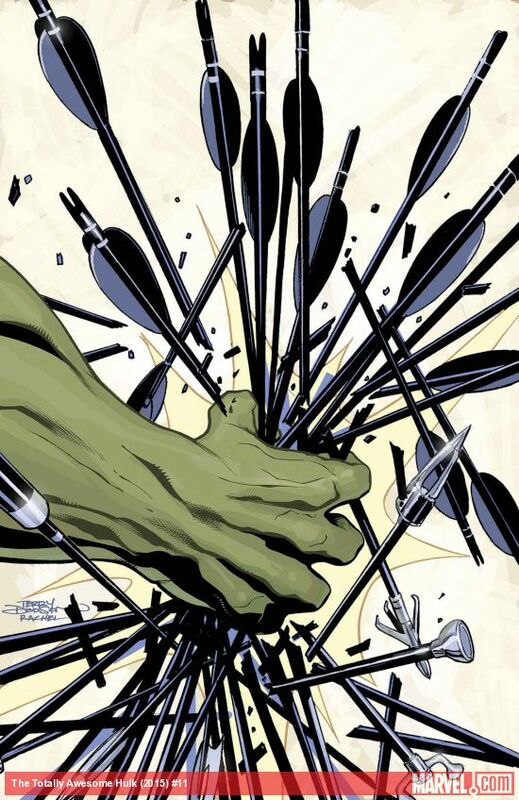 Greg Pak took this idea to a radical conclusion in The Incredible Hulk #110, where Cho postulated that Banner was inside the Hulk at all times, "running the numbers" so no innocents were harmed during his battles. (You may call it ridiculous; I call it comics.) It's only when Banner is incapacitated, like through the involvement of Nightmare, or taken totally out of the equation, as in physically separated from the Hulk, that he becomes a true monster with the propensity for wholesale slaughter. I had a lot of fun writing these issues. It's great to be back writing Banner, and my editors encouraged me to go deep. I hope readers dig it. You'll have to read the book to find out, but I'm working on issue #9 as we speak, and there's a big story to be told there. I seriously can't say any more for fear of spoilers. The story is important, and it's big. You definitely don't want to miss it. AMADEUS CHO has lost someone very close to him. Now he's mad. VERY MAD. No one would like him when he's very mad. Still reeling from a blindsiding loss, Amadeus Cho might be in over his head when the one and only Black Panther comes calling. With the BLACK PANTHER watching his every step, the HULK takes on a mysterious new arch-enemy. But who is AMADEUS really after? Those sure look like purple arrows to me, sort of like those shot from the quiver of a certain avenging bowman. When we asked about the Hulk’s role (...) the Marvel reps passed on the question. That’s the only question they refused to answer, so it seems something big will be happening with the Hulk(s). Later, Bendis said that “something very unique” will happen to the Hulk in that issue. "I'm probably going to have to unplug my computer for a few days. Something big happens in each issue, but this will probably be the most debated," he said. As the story unfolds this new seer predicts the hero in question will be the cause of a major incident of destruction in three days, requiring the other good guys to make a tough call. The writer just hasn’t figured what or how bad that cataclysm will be. “It has to fall somewhere between Hitler and self-defense,” Bendis says. “What if the pressure causes (the hero) to commit suicide,” suggests James Robinson, another Marvel writer, adding that it could be a good way to draw attention to the scourge of cyber-bullying. But editor Tom Brevoort’s Spidey-sense is immediately tingling. “I don’t think you’d want a Marvel Super hero committing suicide,” he interjects. I don't think there's any question that the Hulk is "the hero in question." Nor do I think there's any character more apt to attempt suicide for his own actions than Banner. And then, we turn to Bendis--who wrote the New Avengers: Illuminati special from 2006 that spelled out that the Hulk was responsible for countless recent murders as reason for the heroes to exile him offworld--and Alonso--the editor of one of the worst Hulk runs in the character's history--coming up with a solution to their problem. I don't know about you, but I'm seeing two creators who don't seem to understand the Hulk's base appeal coming together for an execution. Shortly after Civil War II #3, Marvel is releasing a tag-team of one-shots, The Fallen and The Accused, with both their creative teams unknown save for the variant cover artists. There are three for The Fallen: Leinil Yu, Mike Del Mundo, and...Jack Kirby? Yu drew some of Indestructible Hulk; Mike Del Mundo is the current Totally Awesome Hulk artist; and Jack Kirby is the Hulk's creator. 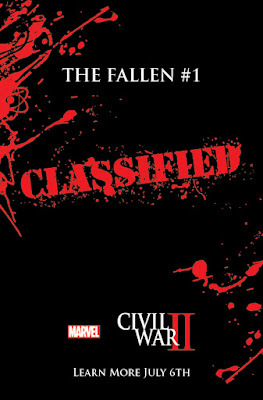 Anyone want to bet that The Fallen--sure to have a different title revealed shortly after Civil War II #3 drops--will be written by one Greg Pak, and perhaps drawn by Alan Davis, and feature a memorial to the newly-deceased Bruce Banner? Hulkinued later this week...because you're not gonna like me when I spell out what's wrong at Marvel! You know, it's weird... The Hulk has been my childhood hero and I more or less went with all the changes they made to the character (you kind of have to). But I always preferred the most common version with Banner changing into a Savage Hulk when angry. It's just something that I'm most comfortable with. I'm always hesitant at first to accept a new personality or "status quo" and start to count the issues until the change is reversed or a reboot is in order (seems to happen a lot these days). When I heard that Amadeus Cho was going to be the new Hulk, I think I was less hesitant than other times to embrace the change. Mainly because I like the Amadeus Cho character Pak created and I really enjoyed his writing during his first run. But I guess I have a more personal connection in that I am also an Asian American born in Tucson! Now, I'm usually the first to roll my eyes when Marvel arbitrarily changes the race/ethnicity of one of their characters, but I guess this is one of those cases where I actually identify with it. I mean, it's almost literally seeing my childhood dreams being written out now in the comics! I can see now how people of color can relate to Sam Wilson as Captain America or Miles Morales as Spider-Man. Yes, there is still an argument to be made about messing with the past and tradition, or making it confusing to new readers or those who are just familiar with the cinematic versions. But I actually became surprised at my own reaction when I saw some people in messageboards, etc. reject the Cho Hulk without good reason. I became kind of defensive, as if I were the target of some subtle racism. So I guess my views have become a little more progressive in these matters... funny what a comic book can do. To start with, let me be clear, I love Amadeus Cho as a character. I was a huge fan of him in World War Hulk, and when he continued in the Incredible Hercules I found him great. That said, I love Bruce Banner as a character even more. This isn't because Banner is white and Cho is Asian, it's because I grew up reading about Bruce Banner, I literally learned to read from Hulk comics. To me this isn't a problem of "This is a disgrace because the Hulk isn't supposed to be Korean!" but more about my love for the original character. As far as I am concerned, the Hulk isn't an office like President or head of SHIELD, the Hulk is Bruce Banner. On top of that, because a major part of what makes the Hulk interesting is not just that he's got super strength (I mean, he's far from the first character with that power) but that he has to struggle to keep things under control, something that isn't part of Amadeus Cho's character at all. To be clear, I'm also not a fan of when they try to normalize Banner, either the "merged Hulk" or when Banner is in control of the Hulk's body like in the early to mid 1980s, or when they "cure" him (which happens constantly these days), so this isn't just a concern of mine about Amadeus Cho but about what makes the Hulk different in general. Stating this is about being more progressive because you prefer Amadeus Cho as the Hulk to me is framing the question in a very strange "Democrats love the New Hulk, only Republicans care about Bruce Banner!" way. To me this isn't a political issue, I love the idea of a more diversified field of characters, but replacing established fan favorites with new versions of the characters to diversify is just setting them up for failure, and will just lead to "Female Thor" or "Asian Hulk" getting sidelined when Editorial gets nostalgic or decides they need another "return to status quo" reset so they can do it again. Rather than create what comes across as stereotyped (and mostly very poorly executed) replacements, I would prefer Marvel and DC put effort into establishing new heroes. Instead of these constant events to kill off or replace established characters, it would be great if they used one of these events to build new characters and go from there. I am not feeling this series. Like all Hulk fans I gave it a shot. TTAH#8 was the first real issue I liked. I believed Pak would get back to Banner eventually and he did. But now that I got a taste of Banner again..I want Cho gone as the Prime Hulk. Could I like Amadeus Cho? Sure! It just seems Pak can't write him good enough for me to ever like him. Hickman wrote a great Cho and Banner. Maybe that resides the problem with me and this series. I seen both these charcters utilize and written great by other writers. I have always felt Pak was off his game when he came back on his Incredible Hulk 600 run. Yes he gave us World Breaker Hulk unleashed..but the stories leading up to it was pretty lack luster and void of any deep character growth. It was like Jordan retiring and coming back to play for the Wizards. Glimpses of greatness but ultimately falling short of the mark. Right now it's the way Pak crafts stories. They seem so bland and basic. Could he be over worked? That is a possibility. Pak has great ideas for themes..but lacks that killer instinct to execute it to my standards. I have voice my opinions on each issue. After issue four Greg Pak blocked me on twitter. The same guy who soaked in all the praise for Planet Hulk, WWH and Skaar Son of Hulk, now can't take any critique on his writing. I don't get as riled up any more about this as before. I just stopped buying the product. Sales are not doing that good. Maybe that forces a change...fingers crossed for a return of the old Savage Hulk or a new writer who can appease the old gamma base.